This Diamond Wedding Ring pattern has essentially been in the design stage for approximately fifteen years. 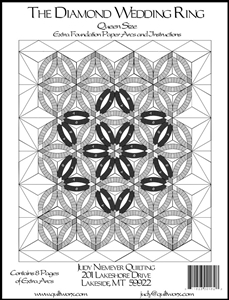 During that time of my life, I had no idea what paper piecing was and I have often thought back on my first experience with the pattern, wishing I knew then what I do now. A lady approached me to finish a quilt that her mother had started. She called the quilt The Indian Wedding Ring. I agreed to finish it, not realizing that it would turn out to be the most intricate pattern I had ever encountered. I was absolutely thrilled when it was completed! Since then I have discovered paper piecing, I have always remembered that quilt and the headaches it gave me. As I worked with my son on my first pattern, The Wedding Star, the quilt I had done years before lingered in the back of my mind. After considerable thought, a preliminary design of The Diamond Wedding Ring was drafted. It was, however, far from completion. A few years later I received a phone call from a 91 year old lady who had just completed the Wedding Star and wanted to know if I had any others. I told her I didn’t have any completed but that I was working on several new ones. She then asked me if I had ever seen the Triangle Wedding Ring. We talked about it for awhile and I realized this was the same pattern as the Indian Wedding Ring that originally inspired me before. Our conversation motivated me to revisit the pattern and The Diamond Wedding Ring is the result of my efforts. This quilt is great for both the beginner and the advanced quilter. 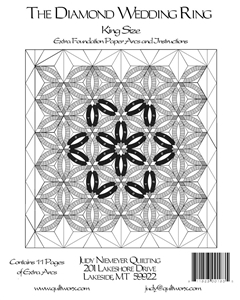 It is done with foundation paper piecing with easy curves which lie flat when finished. I’ve developed a strip piecing method for the arcs, added an extra star behind the center star, and used a variation of colors not only in the arcs but the backgrounds as well to compliment this design. Despite the fact that the centers and backgrounds are on the bias, this quilt is constructed to simplify the setting of the blocks. Read and follow all instructions step by step, using the graphics to show you how to set this design together in the quickest, easiest way. 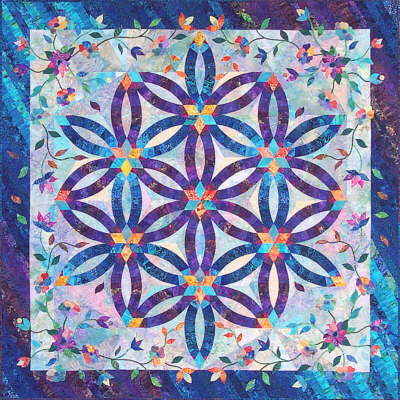 Beth DeLauder has Karen made every Quiltworx pattern? or are you the pattern tester? Teresa Jacober Wondering - did she use a Strip set or own fabric choices? Gunn Tepstad I made this quilt for my daughter's 30th birthday. The red flowers were cut from a childhood dress. Susan Lanham Lee I did this one with Kelly! Love it! Robin Booth I really like your design. Colors are very pretty. Susan Lanham Lee Its even better in person! Love it Kelly Sutton Grant! Adele Ash Makes me want to quilt!! Carol Bilodeau Awesome love the bright colours. Carol Underhill This is so beautiful,such talent. Barbara Wylie McQuade Love this one...so vibrant, & it is so lively !! Sharon Wiley Awesome love the colors!!!!!! Shirley Kottkamp This is beautiful. There are several women in our yoga class who could do this. Such talent. Karen White Beautiful work of art. Peggy Shipman Agee This is beautiful. Jane Gilreath Mulligan Love this! Linda Almas Yumm! Eye Candy!!! Denise Wessel Blaine Burnett Beautiful! Marie Bowman Awesome!!! A work of art!!! Janie Steele Incredible quilting. Enhances the quilt. Faith Burgwin Stewart Donna Charette big quilt shows this week. Brenda Barnett Retzlaff Wow, wow, wow! Pat Burke So beautiful!!! Jennifer I hope this one will be your next project. Linda Wilhelm This is so beautiful. Absolutely live the colors and appliqué. Sharon Jackson Oh how beautiful! Do you know how hard that would've to make! Terri Budesa Pink isn't really my color but this is very pretty! Alice Latham Self Oh yes. Beautiful.